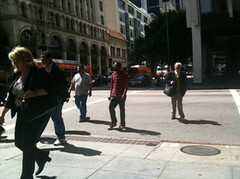 Downtown Los Angeles on a Spring Friday: a circus of everyone dressed in everything yelling whatever. It almost makes me wish I still rode the bus. Almost.